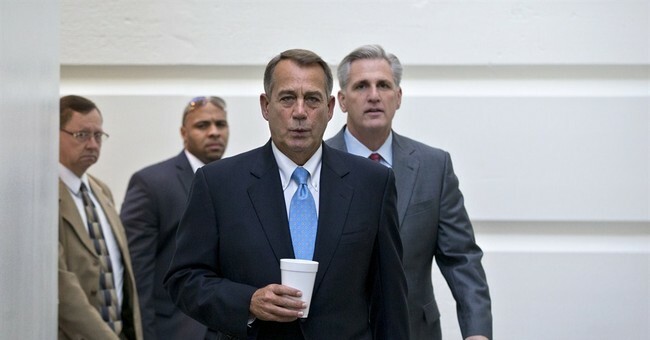 Whispers: Might the House GOP Adjourn and Leave Town After Passing 'Final Offer'? This would be a highly risky take-it-or-leave-it strategy. The GOP would argue that they gave Senate Democrats everything they asked for in their latest deal, but added a delay of a job killing tax that 79 Senators have already voted to repeal altogether, as well as a somewhat stripped-down Vitter Amendment. This would force members of Congress, but not staffers, to forego the president's special subsidy carve-out. The bottom-line message: "We've agreed to Harry Reid's plan, plus a few small additions that the American people support. We've bent over backwards to accommodate the other side. We've done our jobs. And we're outta here." That...might work. But it also might add to the (largely unfair) perception that Republicans are the obstinate, unflinching actors in this crisis. Harry Reid is likely to say "stuff it" to the House-passed bill -- if it passes. That's been his consistent position on almost everything, no matter how reasonable. If we hit the technical default wall with Republicans effectively AWOL, I'm not so sure those optics would work well during the ensuing, intense blame-game. Especially since the drumbeat GOP critique of Democrats over the last few weeks has been that Obama & Co are unwilling to negotiate. At the moment, nothing is certain. Votes and coalitions are fluid. And the clock is ticking. Stay tuned. breaking from Senate GOP source: "the reinsurance tax is OUT of what’s being negotiated between Reid & McConnell..."
Tom Cole says some members suggested House leave after vote but hopes they won't. "We don't want a take it or leave it" approach. UPDATE III - White House rejects the deal. Does Boehner even have the votes? GOP leadership may be re-writing their counter-deal already, under pressure from conservatives. Shades of the "Plan B" fiscal cliff fiasco, which eventually resulted in a worse outcome for conservatives.